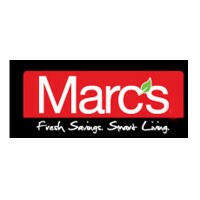 Marc’s is a discount chain of pharmacy and grocery stores. These stores are commonly found in northern and central Ohio. The owner of the stores also has a chain of stores that can be found in western Connecticut. This company has a media block, where the owner and employees do not speak to the media. For information on your Marc’s application, follow the link below. Founded in 1979 in Parma, Ohio by Marc Glassman, it is currently headquartered Middleburg Heights, Ohio. There are currently around 60 stores across the Cleveland, Akron, Canton, Youngstown and Columbus general areas. They opened their first superstore in Garfield Heights, Ohio in 1992. This company prides itself in being locally owned and operated. Marc’s is famous for their store’s closeout section. Their target base is cost conscious customers that are looking to save money on a wide range of brand name products. Their stores often are very high traffic facilities, which service thousands of customers daily. They have a consistently rotating door of products, sure to please any of their customers. Marc’s is looking for employees that have amazing customer service skills. They want staff that is as passionate in regards to sales as they are. They want staff with an attention to detail and that have knowledge of their products in order to properly assist their customers. Most of all, they want their customers to leave their stores completely satisfied with their experience. There are plenty of career opportunities for people of all types of skill sets to find something they qualify for here. The retail store offers a wide variety of entry-level positions so that a person can grow their job into a Marc’s career. Some positions at the retail level are stock clerk, cashier, and store manager. At the corporate level, people can find some entry-level positions to grow with them but most of the positions at the corporate level are higher level positions that require more experience and education. There are also jobs available in the distribution center. Such positions are warehouse worker, public relations, marketing, and CDL driver. There are different requirements to gain employment for the different positions. Some entry-level positions require little or no education or experience. Other higher level positions may require a high school diploma and equivalent or a college degree with several years of experience. How old do you have to be to work at Marc’s? The minimum age of employment is 16 years of age. Marc’s offers similar benefits to others in this industry. Employee eligibility of benefits will depend on hours worked weekly and their job title. Employees may receive health insurance, dental insurance and vision plans. They may also receive paid time off, life insurance, and 401(k) plans. They may also receive employee discounts on prescriptions and other products. The hours of operation may vary depending on the location. They may also have different hours during the holidays. Some holidays may cause store closures for the entire day. For more information, you can check your local store. Generally, the hours of operation are Monday through Saturday from 7:00 am to 10:00 pm, and Sunday from 8:00 am to 10:00 pm. Cashier- A cashier is responsible for handling customer transactions at the register. They must be aware of payment policies that the company has put into place. A cashier may be responsible for assisting customers on the store floor and helping the customers find things around the store. A cashier may earn around $8 per hour. Stock Clerk- A stock clerk is responsible for ensuring the store is properly stocked. They should know where the inventory is in the back room to quickly stock the store as needed. The stock clerk is also responsible for maintaining the stock room and ensuring the stock room is neat and organized according to company policies. A stock clerk may earn around $9 per hour. Pharmacy Technician- A pharmacy technician will assist the pharmacist in handing prescriptions. They will refill and fill new prescription orders under the watch of the pharmacist. They will help ensure the inventory of medicine is up to date and more is ordered if necessary. They will handle discussing medicines with doctors and keeping customer records up to date. A pharmacy technician may earn around $10 per hour. Store Manager- The store manager is responsible for running the daily operations of the store. They will hire and fire employees as necessary. They will also perform job interviews. The store manager will ensure staff is trained in accordance to company policies. The manager is responsible for maintaining the staff schedules and payroll. They will also handle the store’s budget. A store manager may earn around $57,000 a year. These are some questions that you may be asked during your interview. Why do you want to work at Marc’s? The interviewer is asking because they want to know what you know about the company and their core values. This question may require some research prior to your interview. Explain which values you share with the company and why you feel that it makes you a good fit to work here. What do you think your biggest weakness is? The interviewer is looking for you to give an honest answer to what you feel you are weakest at. The interviewer is looking to see how humble you are and how honest you are. Why should we choose you over the other applicants? The interviewer is giving you a chance to sell yourself to the company as the best person for the job. Take this opportunity to discuss your strengths and why the company would benefit from you as an employee. Try not to sound too boastful when doing so. Where do you see yourself in 5 years? The interviewer wants to know what your long-term career goals are. They are looking for employees to stay there for a while, not employees who constantly find new positions. Explain what your career goals are and how the company fits in with them. Why did you leave your previous place of employment? The interviewer is looking to see why you are looking for a new job. Be honest with why you are looking for new employment, but be sure to not be negative about your previous employer. Wondering how to apply for a Marc’s job? You can apply for a Marc’s job directly on Marc’s jobs online. You may also fill out an application form at your local Marc’s. For some positions, you can email your resume to the link on the website. There are no downloadable applications. There are no printable applications online. The easiest way is to apply directly online. The website does not have a clear listing of job descriptions and responsibilities for job seekers to find positions that they are a good fit for. When you fill out your application, be sure to do so completely and in accordance to the instructions provided with the application. You should submit an updated resume along with your application. After submitting your application, you should hear back from the company within a reasonable amount of time. If not, you should call the location you applied at to check the status of your application and if they are still hiring for that position. They may also provide additional information, like when interviews will begin if they have not already. You should prepare for your job interview beforehand. You can do this by asking yourself potential interview questions and answering them aloud. This will help you be more confident during your interview, as well as more articulate which may help you seem less nervous. You should be sure to dress in a professional manner. This will help increase your chances of getting the job. Fry’s Food: Fry’s Food offers opportunities for both, beginners and experienced roles. Super 1 Foods: For career opportunities, fill out the Super 1 Foods online application. Superior Grocers: Superior Grocers offers opportunities for both, beginners and experienced roles. Amigos United: Visit the Amigos United application. Stop And Shop: Use the Stop And Shop job application to apply here.